The man with the bullhorn already had been knocked to the ground, repeatedly kicked and beaten. Then the man with a mustache, wearing a sharp suit and a handgun on his hip, raced up and launched a fierce kick, hitting the man with the bullhorn square in the face. The man with the bullhorn was protesting visiting Turkish President Recep Tayyip Erdogan. The man with the mustache is an Erdogan bodyguard. 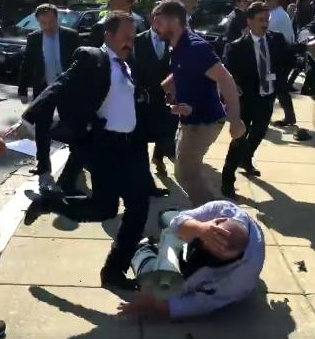 This beat-down, captured on video by the Voice of America, took place Tuesday, just 1.4 miles from the White House, where Erdogan met with President Trump. Nine people were injured, including two who required hospitalization. A similar, but smaller brawl broke out last year when Erdogan was greeted by protesters outside a speech at the Brookings Institution. The State Department issued a statement Wednesday saying it would tell the Turkish government that it is "concerned by the violent incidents .... Violence is never an appropriate response to free speech, and we support the rights of people everywhere to free expression and peaceful protest." It's difficult these days for stories outside the White House's struggle to contain the Russia investigation to gain much traction. But events in and near the White House Tuesday should not get lost in the shuffle. Even without the violence by Erdogan's goon squad, his White House visit should concern those who expected the Trump administration to follow through on its tough talk about confronting radical Islam. For all the talk about naming radical Islamic terrorism where it exists, there appears to have been no mention of Turkey's ongoing support for the Muslim Brotherhood and its terrorist offshoot Hamas. Rather, President Trump publicly lauded Erdogan, saying it was an honor to host him and that he looked forward to working together to create Middle East peace. 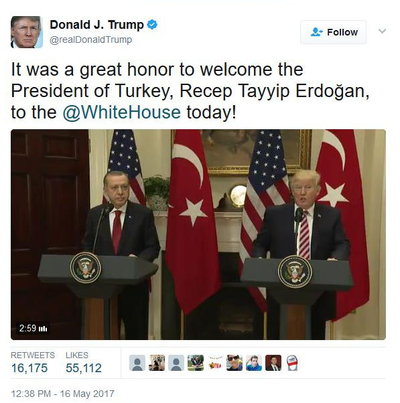 Erdogan is a favorite of U.S.-based Islamists, especially those with Muslim Brotherhood links, like Council on American-Islamic Relations (CAIR) Executive Director Nihad Awad. That may be due, at least in part, to his view that Hamas is not a terrorist group, but a national liberation movement. Erdogan provided a safe haven for Hamas operative Salah Arouri even after Arouri was implicated in the deadly kidnapping of three Israeli teens that led to the summer 2014 war between Israel and Hamas in Gaza. In that conflict, Erdogan predicted that Israel would "drown in the blood that they shed," and likened the Jewish state to Adolph Hitler: "Just like Hitler tried to create a pure Aryan race in Germany, the State of Israel is pursuing the same goals right now." Arouri was asked to leave Turkey only last year, as part of an effort to restore diplomatic relations between Israel and Turkey – relations Erdogan severed in 2010. But that doesn't mean Erdogan has turned a corner. In February, Turkey hosted a meeting of Hamas officials and affiliates. Last week, Erdogan repeated the baseless claim that Israel is an apartheid state, asking, "What's the difference in Israel's current practices from the racist and discriminatory policies implemented towards the blacks in America in the past, and in South Africa more recently?" The ignorant talking point ignores the equal voting rights enjoyed by Israeli Arabs. The International Committee of the Red Cross rejected Erdogan's rhetoric outright: "There isn't a regime here that is based on the superiority of one race over another; there is no disenfranchisement of basic human rights based on so-called racial inferiority." In addition, Erdogan was slow to stem the tide of foreign fighters crossing his border in order to join ISIS in Syria. When he does act, he often targets U.S.-backed Kurdish forces fighting ISIS – a stateless minority Turkey oppresses. While Erdogan and Trump praised each other publicly, ABC reports that "they made little progress to deal with their sharp differences on issues like terrorism and Syria." Erdogan, meanwhile, has purged tens of thousands of government employees, teachers and jailed scores of journalists in a clamp-down on any potential opposition. His crackdown is not limited to his own borders, as European critics have been targeted for arrest and surveillance. Under his rule, Turkey's secular education system has been weakened as religious training schools known as imam hatip grew more than 15 times in enrollment since 2003. His radical Islamist Justice and Development Party (AKP) wants Turkey to be governed by an Islamist authority that demands adherence to strict religious tenets. The White House meeting lasted about 20 minutes, McClatchy reports. Beforehand, 81 members of Congress issued a statement urging the president to raise Erdogan's human rights abuses in the meeting. "Erdogan and his allies have mounted an assault on the rule of law, particularly using sweeping state of emergency authorities to stifle fundamental rights including free speech, undermine the independence of the judiciary, and quash any opposition to their undemocratic actions," they wrote. There is no indication whether that topic was discussed. After the meeting, Erdogan expressed appreciation for the president's hospitality. That's fine, but the failure to openly challenge Erdogan's increasingly Islamist, authoritarian direction is disappointing. Turkey's help is needed in the fight against ISIS. But if the United States intends to confront radical Islam, it missed a golden opportunity on Tuesday. President Trump did ask that Turkey release jailed American pastor Andrew Brunson, the White House readout of the meeting said. The two leaders also plan to meet again next week during the president's first official international trip. Unless he challenges Erdogan then, the lasting images of this will be the unprovoked violence Erdogan's armed bodyguards inflicted on peaceful demonstrators in the heart of the nation's capital instead of a direct and honest challenge to Erdogan's ongoing and egregious support for Islamist terrorists.